Berlin is one of our family favourites. We used to go to Berlin lots before the babies arrived. One year we went there three times and had a taste of all seasons. Their summertime is fab. The cold winter doesn’t make a difference to Berliners, as people are still out and about as a family. It’s definitely a place where I feel it’s easy to take babies or two small children. Like most German cities, there’s a big family focus. Plus their U-Bahn train system and facilities are pretty well organised. We last took Big Munch there when she was a one-year old and busy cruising around. The below top tips focus more on the East side of Berlin as that’s the side we really love. So here’s lots of reasons why you should go to Berlin with the little ones. Where to hang out as a family? As with any city there are so many things to do as a little family. We love Berlin’s heritage so the museums are incredible. There are also everyday places to hang out like cool cafes and in particular kindercafes. All kindercafes have a designated play area for babies and children so grown-ups actually get to eat their own cake! We loved hanging out in our local kindercafes after a day of exploring Berlin with Big Munch. 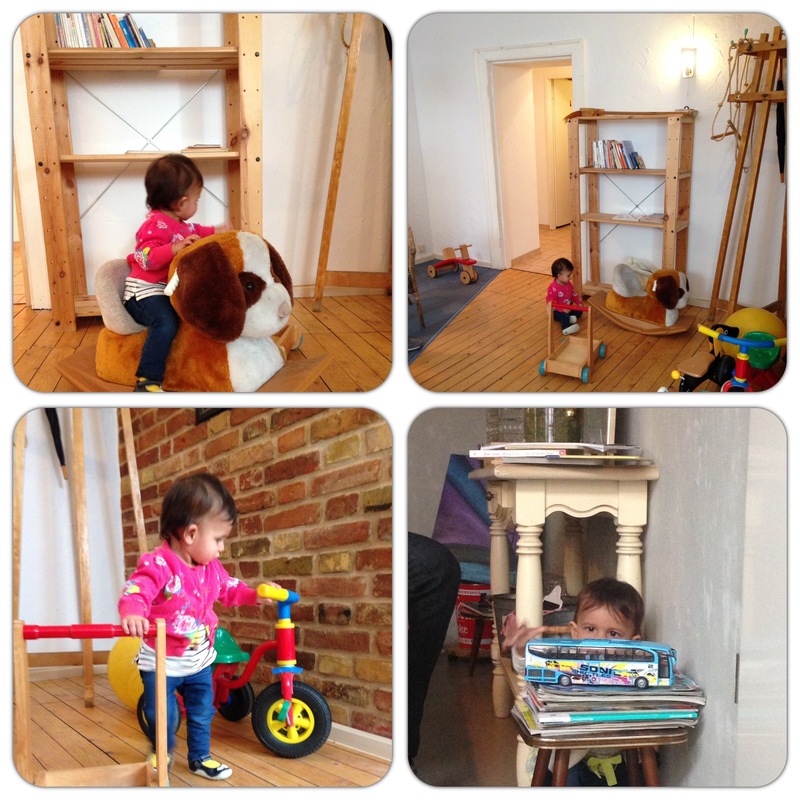 If you’re not staying around Mitte then check out your local kindercafe on Google. All of these cafes are breastfeeding-friendly along with most other cafes and restaurants in Berlin. I just wish we had more kindercafes in London. 2. Parks, playgrounds and beaches! Come rain or shine, families love hanging out at the playground in Berlin. Check out this handy post by Sarah on some of the best playgrounds. Originally from the UK, Sarah moved to Berlin with her little family in 2007. One of our favourite parks is Mauerpark at top of Prenzlauerberg. It proudly features a part of the Berlin Wall and there are also mega flea markets if you want to search for vintage bargains. Another great park is Volkspark in Friedrichshain which has a cool water playground. Berlin’s summers can be seriously hot so these are perfect locations to cool off with the little ones. Beaches, yes there are actually beaches in Berlin. Note they’re artificial ones in the Summer but it does make you feel like you’re suddenly in Ibiza. We loved going to Badeschiff Arena. There’s an artificial beach and an outdoor swimming pool which floats in the river. There’s also a nice splash pool and children’s area for serious sandcastle action. Don’t forget to take your own towels! 3. Oderberger Strasse, Prenzlauerberg. Jump off at the U-Bahn stop Eberswalder Strasse. This is a lovely neighbourhood to visit with lots of cute shops and cafes. 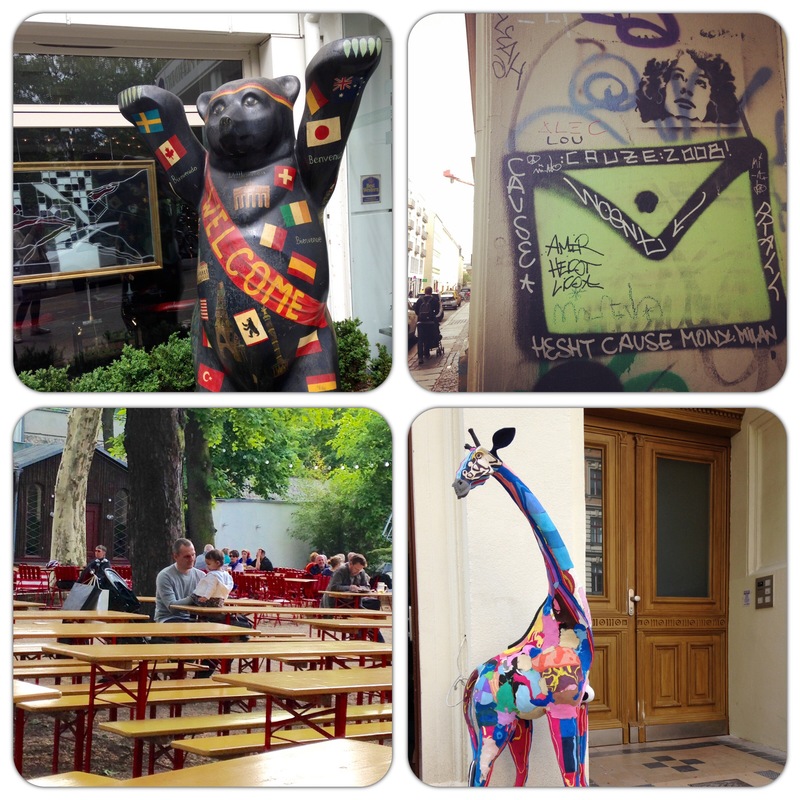 What else to see around Berlin? 1.East Side gallery which is one of the largest remaining parts of the old Berlin Wall. This is a must-see for anyone heading to Berlin. Artists are commissioned to decorate what is basically the world’s largest outside muriel. It’s street art heaven! It’s an incredible place and we visit East Side Gallery every time we pop to Berlin. There are a few cafes hidden behind the wall, including the artificial beach in summertime. You can reach the East Side Gallery via U-Bahn Warschauer Strasse. 2.Berlin’s everyday street art…Somehow the local councils in Berlin don’t get round to removing the street art, which is great! Street art has become an everyday sight and makes the Berlin neighbourhoods special. It’s a key part of Berlin culture, the city woudn’t be the same without street art. It’s one of my favourite things to spot in Berlin. 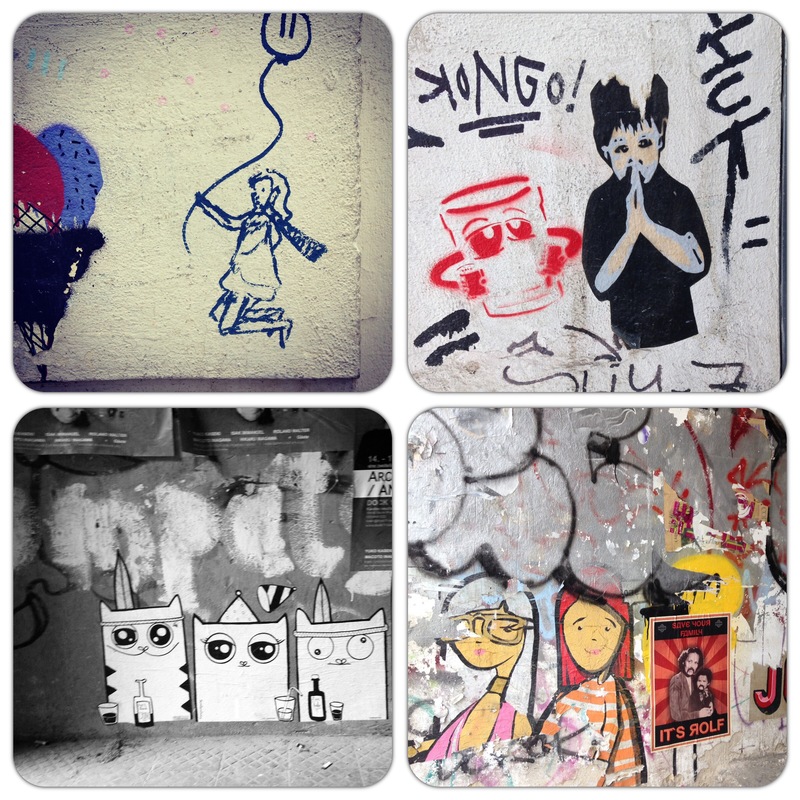 If you’ve popped by Lucky Things Instagram you’ll know Berlin street art is a regular on there. Street artists travel from all over the world to leave their art behind. Bordering neighbourhoods Mitte, Prenzlauerberg and Friedrichshain are all decorated with amazing street art.If you think your children would be up for a walking tour, check out the tours run by Alternative Berlin. The street art tour takes you around a few neighbourhoods and ends with a stencil-spray can workshop so you take home your own bit of street art on canvas. If this isn’t practical for your little family, you don’t need to do a tour to see Berlin’s street art as it really is everywhere on the East side. 3. Labyrinth Children’s Museum, Osloer Straße 12, Wedding, in Mitte. There’s lots of things to jump on and climb at this museum to keep children’s energy levels busy. 4. MachMit! Museum for Children, Senefelderstraße 5, Prenzlauerberg. A more traditional musuem for children where they’re encouraged to explore. 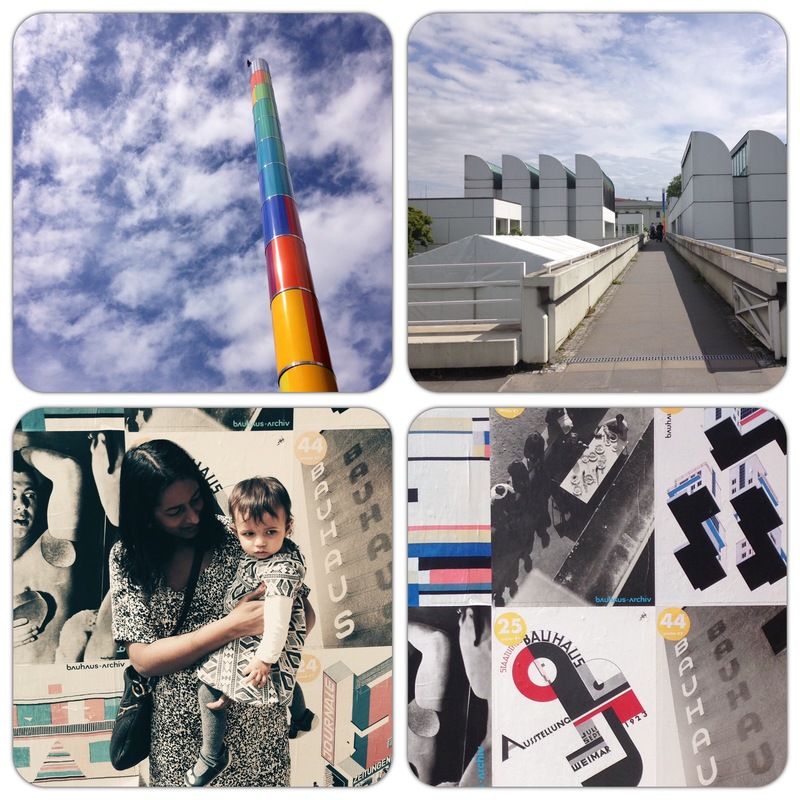 5.Bauhaus design museum...This museum is a great place for grown-ups and families. I remember Big Munch having one of her best tantrums as soon as we entered the Bauhaus. She just wanted to try and run around as she was in cruising mode. Staff were really understanding about the toddler noise and encouraged us to stay although we were close to making a sharp exit! This design museum is based by the beautiful Tiergarten on the West side (Berlin’s equivalent of Hyde Park). Take a walk through Tiergarten on the way back to the U-Bahn. Check out the website for the latest exhibitions. The cafe is pretty cool too. 6. Anne Frank Zentrum (Anne Frank Centre)…This is linked to Amsterdam’s Anne Frank house. It can be found at Rosenthaler Straße 39 in Mitte (just around the corner from my favourite shopping hub). 7. Berlin Zoo…Known as one of the most visited zoos in Europe, it’s also located by the Tiergarten on the West side of Berlin. You can book tickets online through their website. Travel light when you come to Berlin as you’re bound to enjoy the shopping out there. 1. Alte Schönhauser Strasse, Mitte (Rosa Luxembourg Platz U-Bahn stop). As we tend to stay around Mitte, my favourite shopping area will always be Schonhauser Allee. It’s full of independent stores as well as well known brands like Mango and MAC cosmetics. Around the corner is Rosenthaler Strasse. This is a great street to start off with in Mitte and probably one of my favourite places to hang out in Berlin. The site Hackescher Markt site has handy guides on shops in the Mitte area. 2. KaDeWe, West Berlin. When Mr.H decided to take me to Berlin for the first time, he researched the nearest department stores. The KaDeWe is located in a beautiful building. It obviously has everything you need. Lunch or afternoon snacks in the KaDaWe food hall is a must! Also, their toy floors is amazing and they stock lots of great European brands. 3. Pharmacies…If you like your beauty products, always check out the local pharmacy when you spot one. This is where I always stock up on my favourite Dr.Hauschka rose hand cream you may have seen in my ‘time to have baby’ hospital bag blog post. In Berlin they also sell mini sizes for a couple of Euros. Other great beauty brands for you and the baby or kids is Weleda. We swear by their bath wash and body cream as Baby Munch suffers from eczema. There are bigger chain pharmacies like Rossman on Torstraße 49 where you can also pick up baby essentials. Crikey, there are loads of great places to eat in Berlin. There is also a strong Turkish community so kebabs are a speciality. Here are some of our favourite spots on the East side. 1.Bratwursts and beer gardens…You can’t go to Berlin and not eat lunch or supper at a biergarten. You can’t also miss out on their delicious hotdogs Bratwursts. Biergartens are super-family friendly as there’s lots of space. Big Munch loved cruising between all of the benches when she was a one-year old. Families hang out together in the evening too. Our favourite biergarten is Pratergarten, Kastanienallee 7-9 in Prenzlauerberg. There also have good veggie options. It’s handy they have a big sandy play area for the kids too. 2.Berlin brunch…as most places are closed on a Sunday, brunch is the main activity for a Sunday. Some of our favourite places for brunch (and lunch) are on Alte Schönhauser Strasse. A good one is Blaues Band where you can expect your typical breakfast and eggs menu. Come rain or shine, head to Nola’s in Weinberg Park, Weinbergsweg 15. This cafe has some great outdoors space and indoors too. You’ll need to book for brunch at the weekend. 3. Favourite restaurants in Mitte…For some Vietnamese spice we head to Monsieur Vuong, Alte Schönhauser Strasse. Note that queues can be a bit long and it’s not super spacious if there are loads of buggies. One of our favourite for healthy rice bowls and chunky soups is the Korean Yam Yam on the same street (also handy as they do take-aways if it’s easier to eat at the apartment with the little ones). 4. Supermarkets and bio-markts…Pick up your breakfast or snacks for the day from local Rewe and Berlin has some amazing organic markets too. Denn’s Markt, Danziger Strasse 73-77, is one of my favourite organic supermarkets in Prenzlauerberg and it has a great baby’s department in case you need to pick up any toiletries or clothes. We always stay in Mitte or Prenzlauerberg on the East side. Mitte is right next to the main hub of museums and the famous Berlin Tower in Alexanderplatz. Prenzlauerberg is a 10 minute tram ride up the road and it’s a cosy popular neighbourhood with young families. OTA apartments – We prefer to stay in apartments when we’re with the little ones. We’ve often stayed at these “live like a local” OTA apartments whether we’ve visited Berlin with friends or Big Munch. They’re dotted around East Berlin. Our favourite apartment is on Zehdenicker Strasse 5 as it has two bedrooms and sleeps 6 people. The kitchen diner is huge! Apartments are homely and well kitted out. It’s on the first floor and there are only stairs.Around the corner from the Zehdenicker Strasse apartment is Weimberg Park, a big supermarket Kaiser, local restaurants and a kinder-cafe. Check out the website for rental fees. OTA also have a hostel and a hotel in the local area. Another family-friendly hostel is Pfefferbett Hostel on Christinenstraße 18-19, Prenzlauerberg. There’s the Rewe supermarket across the road and lots of restuarants nearby. The buffet breakfast at Pfefferbett is really good value and they have great outside space. Nearest U-Bahn is Senefelderplatz. It’s a 15 minute walk down to Alte Schönhauser Strasse in Mitte. A good hotel or apartment option bang in the middle of Mitte is Circus Hotel. It’s also across the road from our favourite bar/cafe Mein Haus Am See. The hotel is on Rosenthaler Straße 1 and the apartments are at Choriner Straße 84. 1.Getting around...The best way to travel around is on the U-Bahn. If you’re travelling by taxis , You can request a car seat when booking a taxi online but you may not always get a decent looking one. So if you’re going with a baby I’d recommend bringing your own. Also, bring a suitable booster seat for tall toddlers or small children. 2. Sunday closing...If you’re in Berlin over the weekend, bear in mind that 99% of shops and supermarkets close on a Sunday. So we recommend it’s a day for exploring the parks and cool cafes. If you’re there on a Sunday plan where you’re going to hang out (especially if you need to check-out of your apartment/hostel/hotel in the morning). 3. Cyclists whizzing by…Watch out for cyclists lanes on the pavements as they have their own designated lanes and won’t be slowing down if pedestrians are around. 4. Getting around with your buggy…It’s fairly easy in Berlin but we’d recommend taking a light buggy. They’re welcome on trams but there are stairs at most U-Bahn stations. In our view, the best buggy for travelling anywhere at home or abroad? It has to be the BabyZen YoYo. 5. The lingo…Lots of Berliners speak English so it’s easy to get help and recommendations when you’re out and about. If you’ve already been to Berlin, what are your top tips? If you haven’t, when are you going to go?! Leave a comment below and share the blog love. I know we’re looking forward to going back to Berlin with Big Munch and Baby Munch. Thanks for stopping by Lucky Things crew, catch up soon.